My girls are finally both out of elementary school and have moved on to Jr. High. The biggest thing they miss is recess. Having 20 minutes a day to go outside and break up the day is something we all wish we could still do. But playgrounds aren’t what we remember – gone are the merry-go-rounds, seesaws and zip lines. Now it’s all about tether ball, monkey bars and slides. That’s it. I guess I can understand the reasoning, safety first. We all were spun on the merry-go-round too fast and maybe slung off into the dirt. Zip lines never quite worked as they should and it wasn’t much fun dropping a few feet while moving. I supposed even seesaws had their accidents. Especially if you had friends that liked to jump off while you were in the air (damn you Johnny Smith). Crashing to the ground with a board in between your legs is the greatest fear of every 6yr old boy. 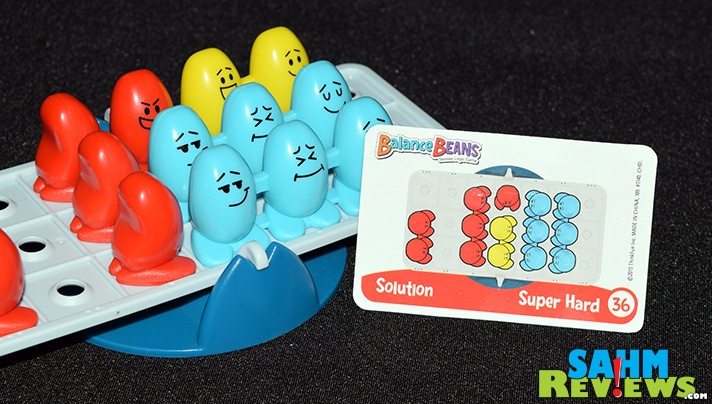 The very latest offering, Balance Beans, from ThinkFun should go a long way in abating those playground fears, and you and your kids might just learn something in the process! 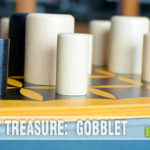 If you recall some of ThinkFun’s other titles we’ve featured (Circuit Maze, Gravity Maze, Shell Game), you’ll remember that their puzzles are more than just one-and-done. 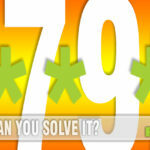 Each title offers an increasingly difficult number of puzzles to solve. 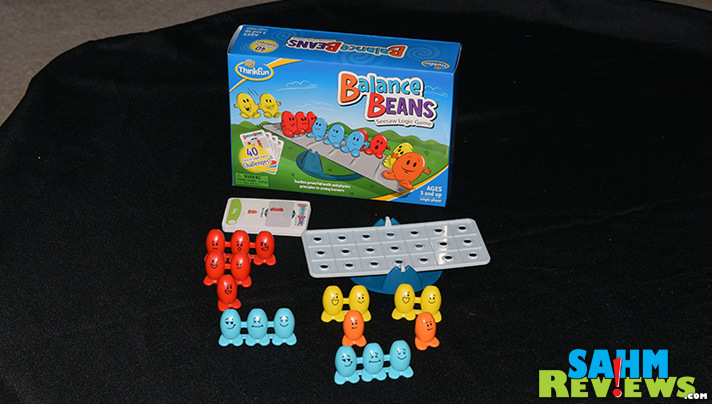 Balance Beans is no different in that respect but is delightfully designed for a younger-than-normal crowd (ages 5+). In the box you’ll find a balance board (seesaw!) 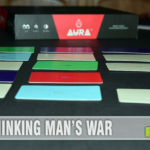 along with 40 challenge cards and various-colored plastic bean-people, some already connected to each other. 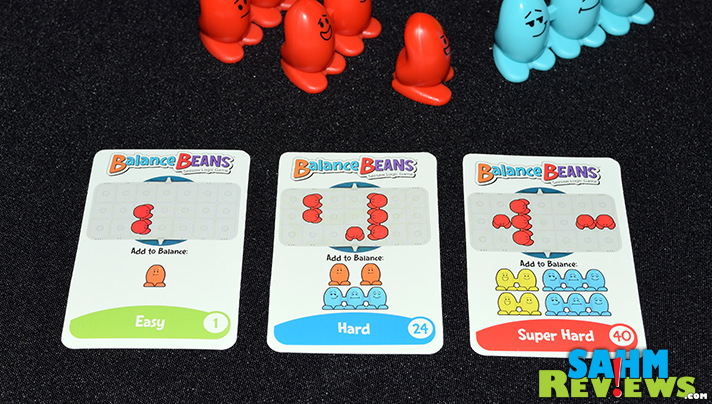 Each challenge card gives you the starting locations of the three red bean clusters and your goal is to use the other-colored beans to make the board balance perfectly. Each bean weighs the same and the clusters are designed to weigh the exact multiple (two beans equal two single beans). The board is also designed in a way that each row moved away from the center pivot point also increments the force by one unit (the second row applies 2x the force of the first row, the third applies 3x). 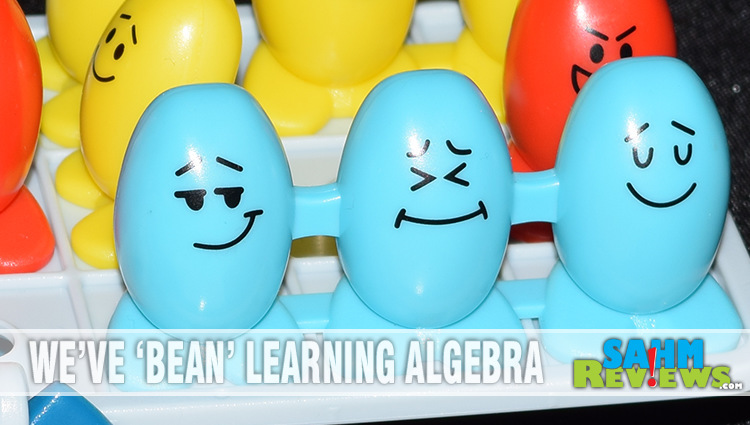 While younger kids will get a kick out of simply matching up the beans to make it balance, the real lesson being taught here is pre-algebra! By creating an algorithm where you’re multiplying mass (the weight of a bean) times force (the distance from the center), you can figure out the exact answer to the puzzle without touching a single bean! 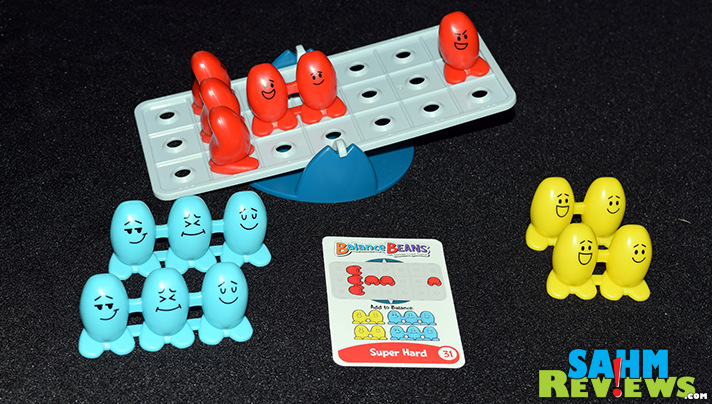 Of course the fun then becomes configuring the beans on the board to match your answer, remembering that the original red beans cannot be moved and that the challenge card dictates exactly which pieces you must use to solve the puzzle. 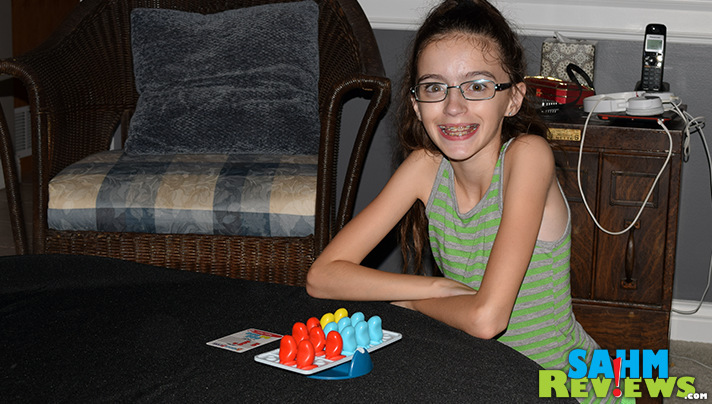 Our age recommendation is for kids 5-9, as our 11yr old easily solved the hardest challenge in the deck. 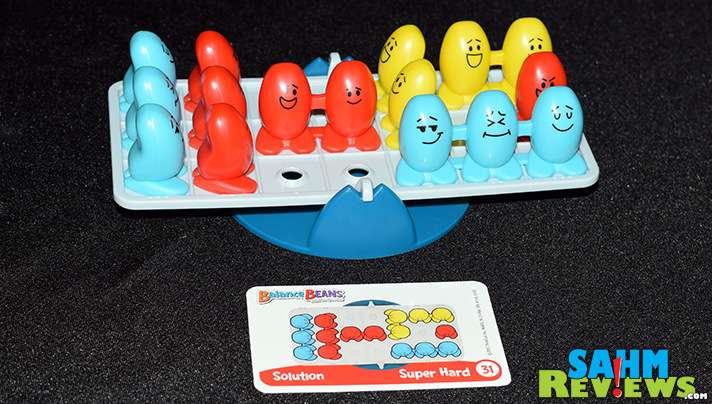 Now, if ThinkFun ever puts out a version with variable-weighted beans and fractional force positions, then we’d definitely be up for the challenge! You can find your own copy of Balance Beans at Target, Barnes & Noble, neighborhood toy stores and of course, on Amazon for under $18. If you like challenging puzzles like this one, be sure to follow ThinkFun on Twitter and Facebook for new product announcements and maybe even a sale or two! 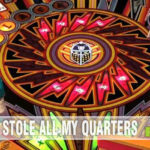 And here’s your chance to win one free-of-charge! Enter our giveaway in the form below and before you know it you’ll be playing with your own playground and not having to worry about Johnny jumping off! When work gets busy I always try to still leave within 30 minutes of the end of the day. It allows me to maintain family time in the evening. My life can get out of whack as I have to then work in the evening after everyone has gone to bed but it helps with the family overall. Saturday mornings have also become ‘Daddy Time’ and I talk the older ones out to a Lowes/Home Depot build event or just something for us to wander around and go do. It gives them some of my undivided attention and gives my wife a break who is with them most days. Thanks for the great contest — this game looks perfect for my two little ones. My formula for a balanced life is to make time for both work and fun every day and spend time with family and friends often. I try to keep fairly calm and relaxed. I don’t get worked up. Have some tea. Just chill out. My tip for leading a balanced life is to relax and not worry so much. Get what you need to get done and then just relax. Do nothing to excess (including relaxing). People these days tend to go all or nothing on everything and that is a recipe for disaster. 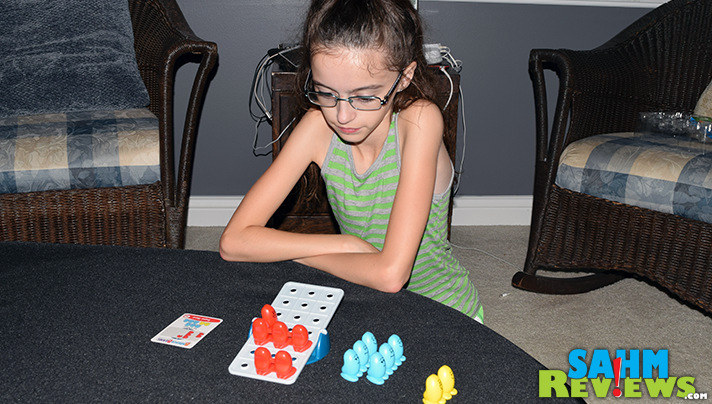 Love games that teach logic to kids! What a fun learning game! Take time off (even if it’s an evening). Take time away from kids (even if it’s an hour). Decompress. Be reverent. This game looks like it is fun. My formula for a balanced life is to eat healthy and exercise. I need help balancing but I try to make a list so I know all that I need or want to get done that day. My best tip is to try to stay organized. I think you got to manage your time well.